David Dauch: "Apples don't fall too far from the tree." 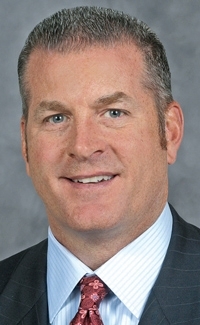 DETROIT -- David Dauch, president and CEO of American Axle & Manufacturing Holdings Inc., was named to the additional role of chairman of the supplier on Friday. Dauch, 49, replaces his father, Richard E. Dauch, who died Aug. 2 age 71 from complications of pancreatic cancer. David Dauch has served on the supplier's board since 2009 and has been the company's president and CEO since September 2012 after his father left the role to become executive chairman. "David has proven himself to be an outstanding and instrumental leader in the continued diversification of AAM's product portfolio, customer base and global footprint," Thomas K. Walker, the independent lead director of American Axle's board of directors, said in a statement. David Dauch told Crain's Detroit Business in September that he has many of the same leadership traits as his father when it comes to determination and execution of a plan. "Apples don't fall too far from the tree," David Dauch said at the time. "I may not be as outspoken on certain issues, but it doesn't change my resolve. I have to set the tone by leading myself ... and now implement the game plan for the team we've agreed to put on the field." He joined the company in 1995 as manager of sales administration before entering executive roles in 2001; he previously served as COO. American Axle reported net income of $25.8 million in the second quarter on revenue of $799.6 million.